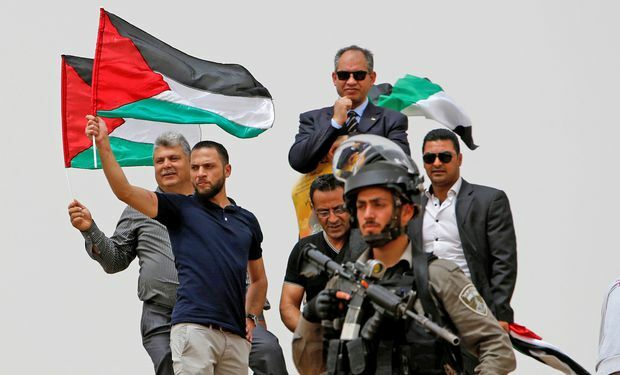 An Israeli border policeman stands guard as Palestinian demonstrators take part in a protest ahead of the Nakba anniversary in Bethlehem on May 10, 2018. Marcello Di Cintio’s books include Walls: Travels Along the Barricades, winner of the 2013 Shaughnessy Cohen Prize for Political Writing. His latest book is Pay No Heed to the Rockets: Palestine in the Present Tense. Abu Ahmed Sa’ad was 12 years old when a group of weary Palestinians arrived on foot seeking a night’s respite in the village of al-Birwa. It was spring of 1948, just after the establishment of the State of Israel on May 14 and the beginning of the first Arab-Israeli War. More refugees passed through in the days that followed, all escaping the fighting along the coast. When farmers spotted Jewish soldiers advancing on the village, the Sa’ads and other al-Birwa families decided to flee. They took almost nothing with them. Everyone believed their exile from al-Birwa would be short-lived. The Sa’ad’s were wrong. Al-Birwa was destroyed. This May 15 marks the 70th year since the Nakba began, but Palestinians would hesitate to call the date an “anniversary.” The word suggests a singular event that occurred long ago, something that is over, like a flood or an earthquake. For Palestinians, the ground has not stopped shaking for 70 years. The land appropriation, injustice and humiliation sparked in 1948 continue to this day. Of all the things I learned during my time with the Palestinians, the most important is that the Nakba is a disaster in the present tense. The uprooting happens in Gaza, too. I met a farmer named Abdulsalam al-Manasrah whose family’s long-held olive groves were bulldozed by the Israel Defense Forces army in 2000 to expand the buffer zone next to the border. The IDF wanted to create better sight-lines for soldiers stationed along the border fence. In the years since, more trees fell as the buffer zone continued to grow. And not just trees. Since the recent Gaza protests began on March 30, IDF snipers have killed as many as 53 Palestinian protesters on a battleground that used to be farmland. The Nakba endures for the family of Mohammed el-Kurd, another Palestinian poet, who was born on the Nakba’s 50th “anniversary” in 1998. When Mohammed was 11 years old, a group of extremist Israeli settlers invaded his family’s house in East Jerusalem. They claimed the property had been owned by Jews before 1948. Under the protection of the police, the settlers evicted the el-Kurds from their home, tossed their furniture onto to the front lawn and set it on fire. The el-Kurd family now lives in the extension at the back of the house built after 1948 while a rotating group of six settlers still occupies the rest. When I visited Mohammed, he showed me a blanket hung on a line between the back door and a window at the front of the house. The blanket acted as a curtain to block his family’s view of the settlers who often stand naked in the windows and make obscene gestures at Mohammed’s mother and sisters. The Nakba also endures for Gazan fishermen such as Ziyad Fahed Bakr. Israel restricts fisherman to a zone near the shoreline where the water is too warm and the sea bottom too sandy for fish who prefer to live among reefs and rocks. High-quality species such as sea bream and tuna swim beyond where Gazans are permitted to fish, and the Israeli Navy enforces this limit. Ziyad showed me the smooth bullet scars on his legs he earned by drifting outside the fishing zone. Every fisherman in the Gaza seaport had a similar story to tell. Abu Ahmed’s stubborn refusal to surrender al-Birwa, in spite of all reason, is an example of what Palestinians call sumud, or steadfastness. This – more than sung slogans or slung stones – is the heart of Palestinian resistance. To practise sumud is to wake each day and endure the small harassments of the occupation without flinching. Sumud is the heroism of staying put. But the Nakba has its own sumud, its own steady perseverance. The catastrophe has persisted for 70 years and shows no sign of abating. Each May 15 there are fewer Palestinians left to recall firsthand the traumas of 1948. Abu Ahmed is in his 80s now. The Nakba will outlive him, too.